Mobile internet usage is accelerating at a phenomenal rate and in Dec 2009 alone, some 16 million people in the UK accessed the internet from their mobile phones. Not only are the number of users growing, but their usage is too, with one in five mobile subscribers surfing using a smartphone. The property portals have responded by launching mobile websites and iPhone apps for the increasing number of home hunters using mobile devices. However, with such a fast growing audience to please, mobile is one of the areas where we will see the most significant developments in the coming years and one of the major developments is Augmented Reality. 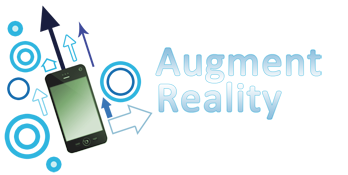 Augmented Reality applications combine virtual data into the physical ‘real world’ by utilizing the iPhone 3GS or an Android phones compass, the phones camera and it’s GPS system. The result is that you can see things like the location of Twitter users and in fact anything they you choose to plot such as Cash machines, restaurants, coffee shops, bars, hospitals, hotels etc, even if they are miles away. I would expect that as you read this you are already thinking about where I’m going with this in terms of property search. 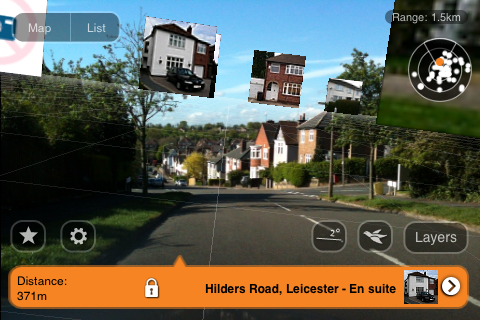 Using this same technology, house hunters walking down a street will/can point their phone camera ahead of them to identify which properties are currently available for sale or to let. This technology already exists and there are currently two applications available that perform this type of property search. 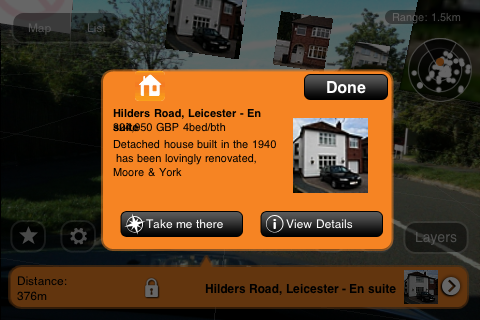 Using the ‘Layar Reality Browser’ application, users can access two further applications called ‘house detective’ and ‘Find a Property’ (not to be confused with TDPG’s findaproperty). Both apps have been built using the Nestoria search engine (more info on the open API here ) and are really good early examples of how this technology will work and no doubt be integrated by the main property portals. There isn’t much difference between the two (the orange one or the blue one) so below are some screen shots from the orange one (Find a Property) to show you how it works. When you go into the app it automatically opens in the camera view and will begin searching for properties in the direction you point the phone. 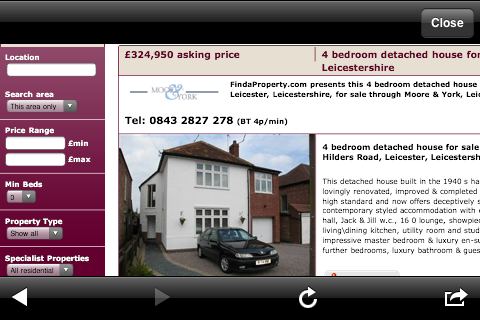 A 3D mesh appears on the screen and the app loads property images onto the grid. 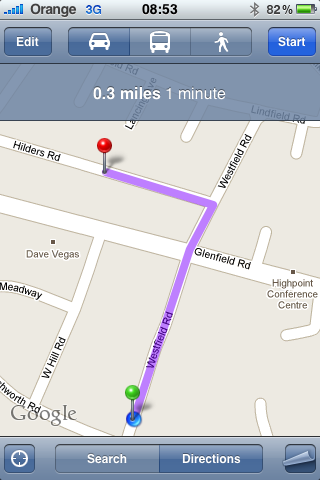 As you touch the properties on the screen, the orange bar at the bottom gives you the property address and its distance from your current location. In the top right corner you also have a ‘radar’ higlighting the density of other properties around you. Touch the bar and it gives you some further basic information about the property and the options to return to the camera view (done), get Google map directions to the property (take me there) or view further details, which takes you through to the listing on the agents web site or portal. 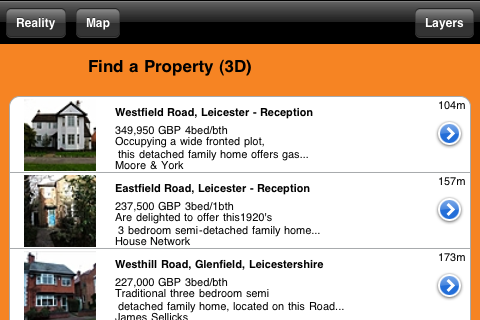 If you prefer, the app can show the properties on a map or in a list and there is also the option to switch between lettings of for sale properties. One additonal feature in the house detective app is the ability to adjust the search range, and whilst there is currently no option to refine the search criteria, I’d imagine this is likely to come at some stage in the future when the property portals get in on the act. For now, it is working on the basic rule of location, location, location. I know of one portal that is already working in partnership with Nokia on this technology for the property world and would be very surprised if the others aren’t doing something similar. So what should estate and letting agents do about this? Do they need to be investing in augmented reality and iPhone apps? My recommendation to most agents would be to focus your initial mobile internet efforts on ensuring your main web site is optimised for mobile visitors. This will mean that it recognises visitors that are using mobile devises and provide them with a better experience on their mobile handsets small screen. iPhone apps are probably the next port of call, but I’d suggest you research well before you spend. A poor app could do more damage than harm as the current users will be fairly switched on users. Unless you are confident of winning new listings on the back of it as one agent I know is (currently losing them to competitors who have them) then maybe leave this trick to the portals. There is no question that the growth in mobile internet searching is something we as an industry need to take seriously if we are to keep up with developments and give mobile users what they want and expect. Interesting post, thank you for this. Goes along with my thinking that none of this technology will actually sell a house but it will well and truly help to facilitate the sale of a house. All Agents need to look at how this sort of technology could enhance their own current marketing stance as it could add huge secondary publicity as well – something that shouldn’t be balked at.